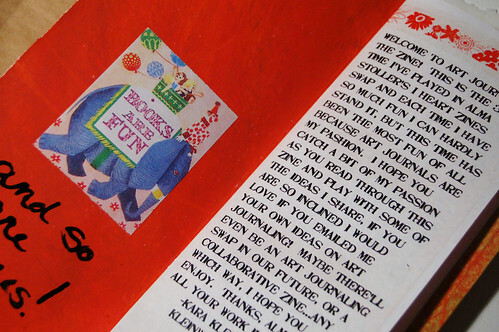 I participated in an annual zine swap set up by Alma Stoller called I ♥ zines last year. 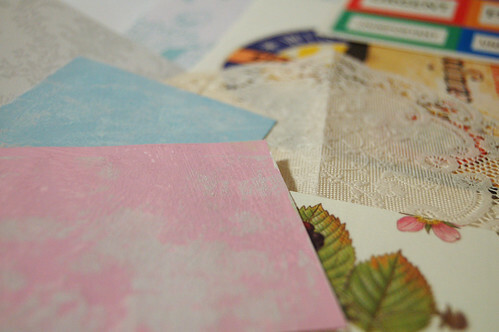 I got a whole package of zines and yesterday I talked a bit about the zines that has a clear Mail Art Theme. The Art subject is a bit more loose but evident in the rest of the zines I recieved. Let’s have a closer look at some of their ideas today! Art offers a great theme for any zine you make, and you can include just about anything inside. 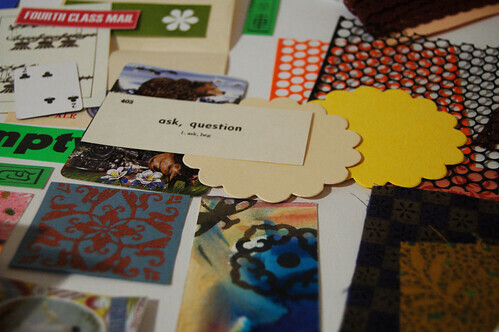 You could just pick any subject that you are currently in to, and make a zine about it, for instance your favorite artist, or a specific period in history, or art material, or mixed media or art blogs, or art museums or… Making a zine is an art form in itself if you ask me! The zine “Shape” is a handmade zine “considering images, ideas, art, negative space, positive impact and creative living” made by Deborah that I?ve bought a zine from before, called Personal symbols. The cover is made out of a huge color chip and a cool Japanese stab binding. A zine can really be any size and made out of anything. It’s only your imagination that sets the boundaries. 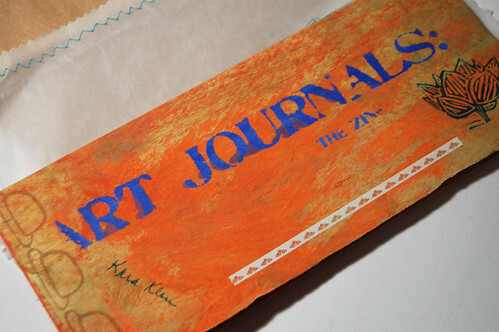 Art Journals: the zine is a very oblong sized zine with made by Kara, who kindly sewed in her moo-card to the first page! 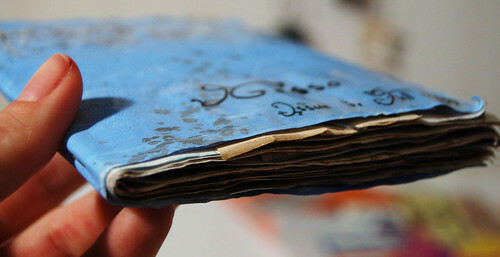 Most of the pages are hand written art journal looking pages that are color copied and made into a zine. One spread is about carving your own stamps, another has links to youtube videos about journaling. The last page is a photo of Kara?s shelf filled with notebooks and journals ? just yummy. And in the last pocket there were a lot of goodies like rub-on letters and the cutest paper doily I?ve ever seen! 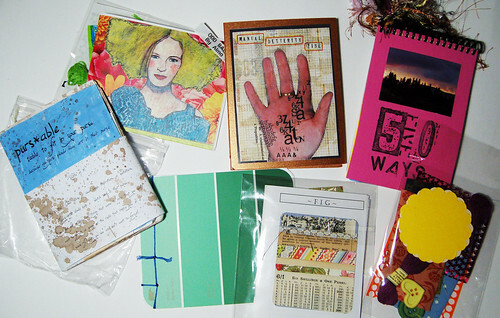 Manual Dexterity Zine is a small sized well designed zine by Lelainia in Canada. It?s got a little bit of this and that, an article about her creative space, music suggestions for creative times and some full color copies of cute art she made. I really like the size and feel of this little zine! You can have a view of this zine at her flickr photostream and in her blog the Tattered Edge. Purs*able zine (meaning a small zine able to fit in your purse!) is made by Sally (See photos above). The fall 2009 issue 3 is all about gesso paint! 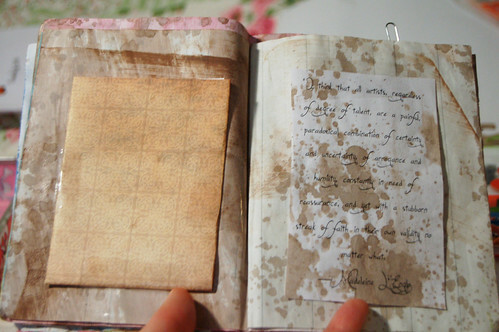 The cover is heavily painted (a mix of gesso and acrylic blue paint I think) and then decorated with homemade walnut ink that was splattered all over everything and on every page in the zine ( recipe included inside). All the information is taped in and almost each little printed paper can be lifted to reveal more text flaps on each page. Reading it is like doing a puzzle. I like that this zine rustles when you touch it, and that the back pocket is filled with notes with creative holiday ideas and other artful ideas. Adorable stuff, I promise. Doily and examples of gesso mixed and layered with paint. Fig Zine (art in the everyday) is a extremely cute one by Michelle. Just like my zine this one is done with a computer for the design; with page numbers, list of content, articles and images both in b/w and colours. It includes cute bird art, haiku poems and an article about finding art in everyday life. It?s just adorable! Paper Rat Zine is very one of a kind unique zine made by Carol of Swallowcliffs Art Studio. 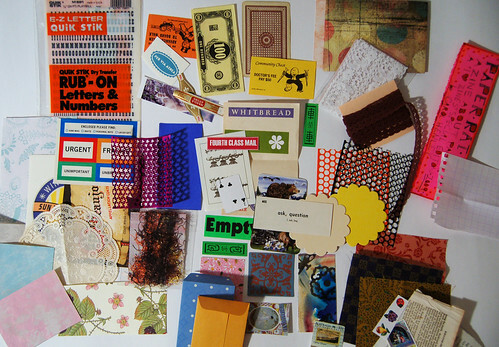 Carol is a true paper pack rat for sure and her zine is like a sampler of that. It includes cool paper experiments, a stamp and her own paper made from plant fibers, a small notebook to take out, an extremely cool apple in Iris fold, a autumn card, cut out kirigami, original collage, two sets of paper dolls to play with, a tape transfer, a paste paper recipe, a yoyo in fabric and lots more examples of what you can do with paper! My favorite is the flower fold envelope included, I?m going to make copies and use in my Art Journals and notebooks for sure. My mom, who also have been enjoying my zines, has already made a flower envelope and used it in her own inspiration book! Odd ball Charm is Alma Stoller?s own zine, and as always it?s filled with inspiration, I’ve written about her Odd ball Charm zine in a post back in 2008 where you’ll find some early zine thoughts from me. You can buy this zine and other back issues in Alma?s Etsy shop! I don?t know how she does it, but even though the projects are small craft projects that I might have passed if they were tutorials online, I just want to indulge in the little things she presents in her zine. Make that odd fabric bird or the embroidered portrait experiment. Since reading Alisa Burks interview with Alma I’m also really thinking about doing at least one embroidery of a glossy magazine, inspired by Alma’s Glossy Project. It is just so cool, and mmm, embroidered! If you’re interested I think you should check out some of these links. You’ll find tutorials, more ideas and lots of yummy zine inspiration! * Zinesters – people who make zines has a flickr group too, I joined it long before I made a zine of my own just to check out what cool stuff people make and share there. Or just google “how to make a zine” and you’ll find lots of diverse links and inspiration. One of the rules in this zine swap that you should include something “a little extra” inside your zine for the recipient to play with. When taking everything out from the 10 zines, this is my haul. Wow, there are lots of yummy stuff right?! I feel like a winner for participating in this zine swap, and I haven’t even talked about the fun of making my own zine yet. Stay tuned. I have only heard back from one other gal in all this time…so it is great that you wrote! You have inspired me to write to ALL of the people who sent me a zine. I wasn’t sure what the protocol was since I had only heard from one person. But…who cares what they protocol is? Right?! It’s always nice to hear from other creative minded people! WOW – nice to hear from you! You are the only one of the 10 people who got one of my zines to write back. I hope this is a lesson learned for me. To say thank you even in a quick mail quite a few months after they sent out their zine is important! 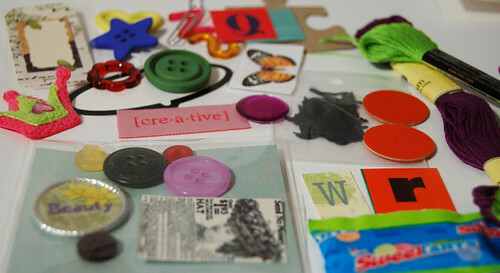 This entry was posted in Art Experiments, Mail bliss, Other's Creativity and tagged REpurpose stuff, zines. Bookmark the permalink. I love handmade items and I also love to share my ideas with other. That is the basic reason I create zines. I love learning about others as well. This exchange was sooooooo much fun. I hope you will join in the next one which will be posted soon. I am soooo loving your blog. What a fantastic collection of zines -I love the different approaches and especially the ‘handmadeness’ of them. I’ve dipped a tentative toe into the zine/booklet sphere! and would welcome any feedback. Love reading your blog – such an eclectic mix of ideas and inspiration. I’ve never heard of art zines before, thanks for intro’ing me to it! Hello, thank you for starting my day of with something great! Going to make time to make a zine this weekend fingers crossed!